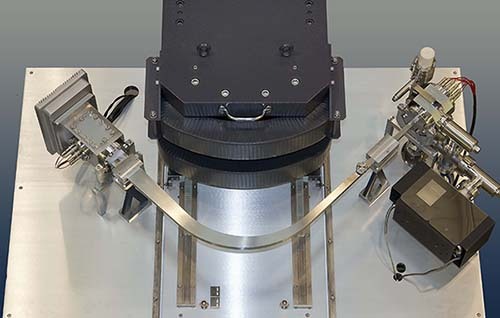 In recent years the noble gas mass spectrometer marketplace has seen moves to increasingly complex instruments with the appearance of movable multi-collectors and ion optics that can modify instrument dispersion. These features were developed to improve instrument versatility but the increased complexity has too often resulted in instruments that require significant effort by their users to produce data at the anticipated quality. NGX was conceived on the premise that mass spectrometers should be fundamentally stable and inherently easy to use. NGX is a multi-collector system that uses conventional ion optics coupled with the very latest electronics, software and clean production techniques. Much of the technology in the NGX has been taken from our successful Phoenix TIMS systems, technology that is tried and tested and known to be amongst the most robust in the industry. Noble gas mass spectrometer design has always been governed by a philosophy of maximum sensitivity at minimal volume. Maximising sensitivity was a primary aim and the design team spent many hours ensuring that NGX would have the lowest possible volume. In order to accommodate a multi-collector whilst maintaining very low volume, NGX uses an asymmetrical ion optical geometry where the magnet shortens the image length of the ion beam. This allows use of a significantly smaller flight tube minimising internal volume and lowering the instrument footprint. NGX was conceived as a multi-collector instrument but with a clear brief to avoid the significant complexities that come with offering multi-collection for all noble gases on the same instrument. Consequently NGX uses a fixed multi-collector with collector geometry being specified by the user at the time of purchase. We believe that this combination of simplicity in operation coupled with extremely high performance for the instruments’ core workload will be very persuasive for many geochemists. The NGX collector is incredibly versatile and can be configured in many different ways. We expect the most common configuration to consist of five Faraday buckets configured for argon isotopes, perhaps with an ion counting multiplier on the low mass side of the array to count 36Ar on small samples. This would produce an instrument optimized for multi-collector argon isotope analysis but which could be used in peak jumping mode for any of the other noble gases including He. Whilst we see argon isotope analysis as the most common application, in fact there is a high degree of flexibility on collector configuration. For example, the system could be configured with nine Faradays optimized for xenon isotope analysis. Equally if maximising sensitivity is the key requirement then a single Faraday and a single multiplier could be used allowing collection of any of the noble gases in peak jumping mode at very high sensitivity since the system volume could be significantly reduced. NGX uses a high sensitivity Nier type source which operates at up to 8kV accelerating voltage to maximise sensitivity across the mass range. The current through the tungsten filament is regulated by trap current using state-of-the-art emission electronics specifically designed for NGX. All focusing settings such as electron energy, extraction, Y-focus/bias, Z-focus/bias and repeller are computer controlled and all source parameters can be saved and loaded from a single file. Also, key monitor readbacks can be viewed in real-time including filament current, trap current & emission current which help characterise the source performance and behaviour. The filament current and voltage are monitored with a 24bit ADC, thus enabling an accurate record of the filament’s power and resistance which can be continually logged over long periods of time. NGX uses Isotopx’s latest Xact Faraday amplifiers which have already demonstrated their performance on our Phoenix TIMS systems. The Xact Faraday’s are incredibly stable and have the fastest response times in the industry. This enables Faraday peak jumping experiments to be performed far more quickly than on previous generations of amplifier. The Xact amplifiers represent the highest performing Faraday detection electronics currently available and are available with 1e11Ω or 1e12Ω resistors to provide incredible dynamic range. 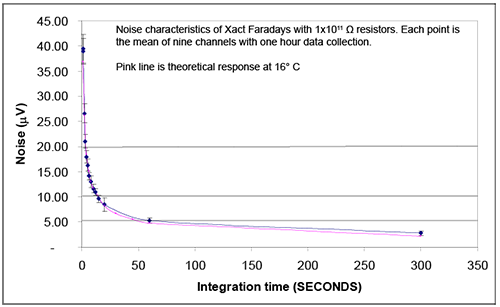 Noise of Xact 1e11 amplifiers (blue) compared to calculated Johnson noise (pink). Click here for information on the performance of Isotopx’s Xact amplifiers. 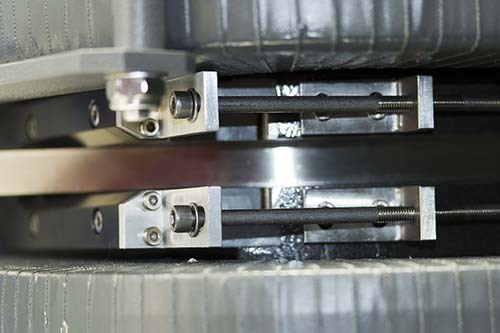 During design and prototyping phases we worked extensively with our suppliers paying special attention to choice of materials and to gaining maximum advantage from 21st century manufacturing techniques. Like our Phoenix TIMS systems, NGX is constructed largely of high quality stainless steel providing the cleanest vacuum. NGX is fully bakeable to 350°C, and includes an in-line SAES GP50 getter pump ensuring a low background static vacuum. NGX uses a 27cm radius air-cooled electromagnet which includes angled entrance and exit poles and has an effective radius of 54cm (the same as the VG 5400). The magnet is based on a design taken from our high performance Phoenix TIMS instruments which routinely generate world-class data at masses as high as m/z 270. NGX users can be very confident in the performance of this magnet no matter which noble gas they wish to analyse. The magnet features Isotopx’s ‘signature’ exit lens which rotates the focal plane at the collector so it becomes perpendicular to the direction of travel of individual ions. Using the exit lens allows us to position the collector array at right angles to the ion beam lowering the internal volume of the collector block and ensuring ions have an easy path to the bottom of their collector. NGX’s large geometry and powerful magnet provide sufficient resolution to fully separate 3He from HD permitting accurate helium isotope analysis in peak jumping mode. The resolution is also sufficient to remove a number of small hydrocarbon peaks that are present as interferences across the argon spectrum. The vacuum envelope is pumped using 2 separate pumps: an 80 l/s turbo-molecular pump backed with an oil-free diaphragm pump and a 40 l/s ion pump. Both pumps may be used individually or together. The mass spectrometer is designed so that typically, the turbo-molecular pump may be isolated and switched off during day-to-day operation and the ion pump provides pumping between analyses. The NGX employs a pneumatically operated isolation valve. The valve is located to enable isolation of the mechanical pumping line to create a static vacuum in the mass spectrometer. This is mounted directly on to the source housing and can be operated from the software. If linked with pneumatic valves on the sample preparation line, this allows opportunity for full automation of sample inlet, analysis and pumping. The new NGX software is optimised to make full use of the instrument’s leading-edge electronics. Operating under Windows® 7 it provides dedicated data acquisition, control, error reporting & data processing. Real-time display of source parameters, system vacuum status and collector readings. Advanced charting tools for easy visual analysis of collector intensities in mass scanning and intensity tuning modes. Includes mass and intensity markers, history scans, user annotations capabilities etc. Provides calibration & profiling tools, e.g. peak resolution, mass resolving power, source consumption, amplifier gain calibration etc. Comprehensive analysis method editor and reporting tools. Data reduction with linear and curve regression extrapolations back to “time-zero”. Allows easy access to all system parameters for immediate manual control. Provides a time stamped log forming a record of all system activity. Exporting of raw data in various third-party formats. Support for external inlet and furnace systems. © 2016 Isotopx Ltd. All rights reserved.